iConverged: iPhone Programming: Who Just Called Me? Well, as it turns out, "1" is impossible, unless the phone is jailbroken. There are no APIs to access call log. Well, not much harm done - you can always enter the number in the app. Note: I am just going to explain the main parts of the program, the "WhoCalledMeViewController" .m and .h files. The rest are standard stuff. You can download my sources and explore. // Created by Arjun on 4/1/11. // Copyright 2011 Hughes Systique Corp. All rights reserved. A few notes here: You need to include the AddressBook headers as well as add the AddressBook framework to your project. 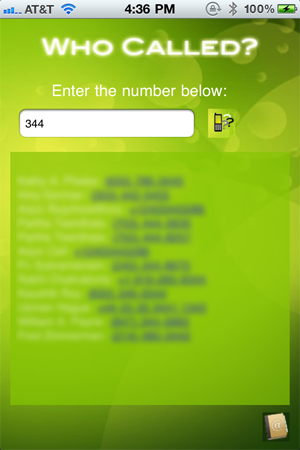 I don't really think you need the AddressBookUI framework as we are not using the address book contact picker UI here. You can try removing it. Finally, MBProgressHUD is a great 3rd party activity indicator that is really easy to use. All you need to do is drop MBProgressHUD.h/m into your project and use away. I think the comments in the header file are clear. the bkgrndClick function is a typical trick people use to make keyboards disappear when you tap on the screen. Basically it involves add a custom button equal to the size of the screen behind everything and then detect when the user taps it - when tapped, we will have the keyboard disappear. One quick note: When you use MBProgressHUD, you need to implement some of its required methods in your file. The <MBProgressHUDDelegate> instruction tells iOS that this file will implement these methods. Gee. I just explained this. The 'tap in the background to make the keyboard go away' trick. Standard callbacks. Just making sure we release the global arrays on exit, and we only support portrait mode. MBProgressHUD has some mandatory callbacks. This one is called when the HUD activity completes. the HUD is removed from the view and deallocated. Okay, so what we do is that when the app first loads, we read the entire address book and copy it into two global arrays. The first one contains the names and the second contains the phone numbers. We ensure they both have the same # of entries. In other words, if 'Bob' has 3 numbers, we populate the Names array with 3 'Bobs' each with a single number. kABPersonPhoneProperty is used to retrieve _all_ the phone numbers associated to an entry. Note that a single records can have many phone numbers. So first, we iterate the address book and get each records, and then iterate each record to retrieve the phone #s associated to it. As we get each phone#, we populate our global arrays appropriately. Note however that we don't directly call loadAddressBook when the app starts. This is because we want to display a HUD while the contact book is loading (because it may take some time). MBProgressHUD requires that we display the indicator, and then launch the 'time consuming operation' in a separate thread. So instead, when the user starts the app, we call initHudAndAB, which basically displays a progressHUD and then launches a thread which calls loadAddressBook. Caution: Make sure you don't do an UI updates directly in a background thread - you will face all sorts of data sync and mutex lock problems. Google around if you want to know more. // remember 3015271111 can be stored in many ways using +, (, ), . etc characters. Okay, and this function does the job of searching the address book for the number you entered in the text box. Basically, it iterates through the global phone list array that was populated when the app started and checks if the number entered occurs anywhere as a substring. This is a further detail to this: the iPhone can store numbers in various formats like +1 (240) 1112222 or 1 (240) (111) (22) 22 or 1.240.111.222 or whatever else. Obviously, if the user enters 1222 we want it to match these records. So to do that, we strip the phone # of all non digits using a cute NSCharacter operation and then compare. Finally, I took another short cut - I just used a UITextView to display the results - it is very convenient because it allows us to have a scrollable list display of data. If you prefer, convert this to a TableView yourself. Its a little more work. Would you please to tell me that which xcode and ios version you used in this tutorial? I got the error message in Device mode "*** -[UIWindow setRootViewController:]: unrecognized selector sent to instance 0x13ae20".